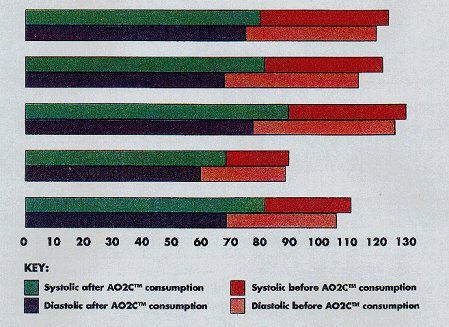 In a controlled lab study completed in April of 1998, The American equivalent of Oxyrich, the AO2C product was tested to determine if oral consumption of the AO2C would have any effect on the systolic and diastolic blood pressure as well as capillary dilation of the test subjects. It was determined that: " Of the 6 test subjects given the AO2C, all exhibited some degree of capillary dilation… (and) all exhibited a reduction in the systolic and diastolic blood pressure ranging from 2 to 8 points systolic and from 6 to 14 points diastolic." The conclusion of the study: " The combination of component ingredients in AO2C has a positive affect, in varying degrees, on capillary dilation… (and) a significant affect on the reduction of systolic and diastolic blood pressures. It is the researchers opinion that AO2C results in greater metabolic efficiency which may correlate to significant energy reductions thus prolonging and enhancing the quality of an individual’s life.